The continuous shine of this exquisite and sparkly diamond engagement ring captures the entire spectrum of your passion and emotion within one eternally radiant treasure. 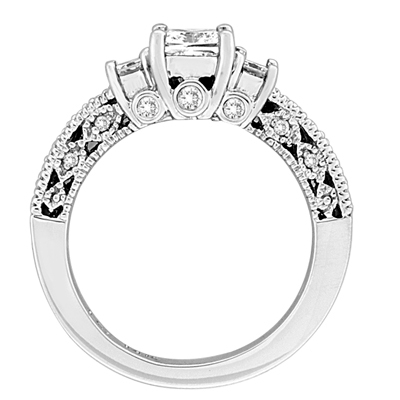 This 14k Gold diamond ring makes a great addition to any jewelry collection and can be worn on many occasions. 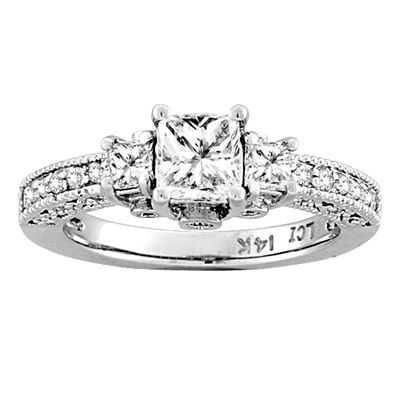 This beautiful diamond engagement ring has a 0.75 carat princess cut diamond in the center and 0.58 carat total weight of side diamonds. The quality of these diamonds are H-I color and SI clarity. The width of this ring is 2.3 mm. at the bottom of its shank. This ring weighs approximately 4.96 grams. This ring is manufactured in the U.S.